Filters are a very powerful and flexible tool which may significantly ease the task of processing targeted content from the sea of information coming through your content feeds. Filters are applied to articles based on regular expression method. If you have a Gmail account and use filters in there, our Feeds Reader filters are very similar. To create an advanced filter, go to Settings > Advanced settings. 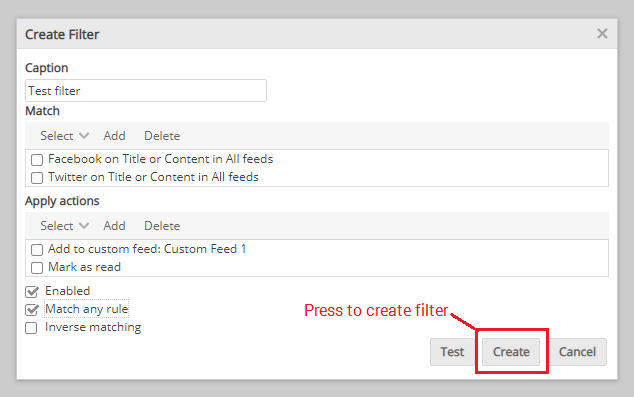 In Filters tab press "Create filter". Each filter object may contain an arbitrary amount of regular expression rules and actions. Each expression may have inverse flag set, which inverts matching result. On top of that, filter may also have an inverse flag, which inverts the final matching. Filter object may be configured to successfully match when either one or all rules match. Regular expressions may be applied to several article (feed item) elements, such as title, content, author, etc. Please, do not include delimiters (e.g. /) when defining a rule's regular expression. Filters are sequentially applied in user-specified order. 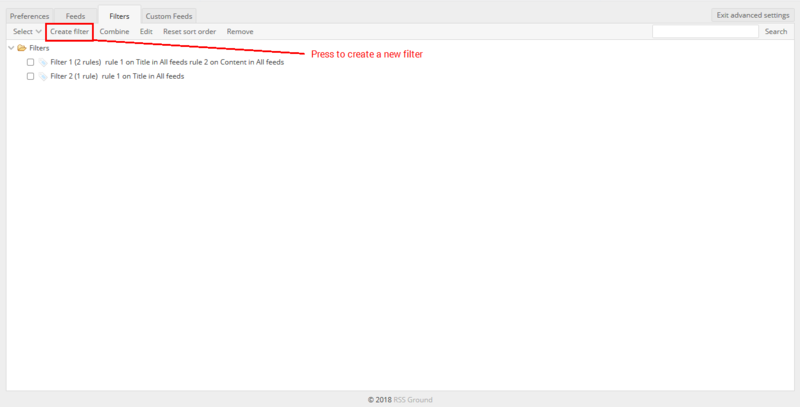 It is possible to reorder filters using drag and drop. If no manual sorting is specified, filters are sorted alphabetically according to user-configured caption. If no caption is specified for any filter, loading order is not guaranteed. NOTE: Filters are applied only when your feed is checked for new updates, they will not retroactively apply to articles already shown in your feeds. For our example we will filter articles which contain specific keywords from content feeds and add these articles to one of our custom feeds. We go to Advanced settings, to Filters tab and press "Create filter". This is going to be our test filter so let's call it the same. 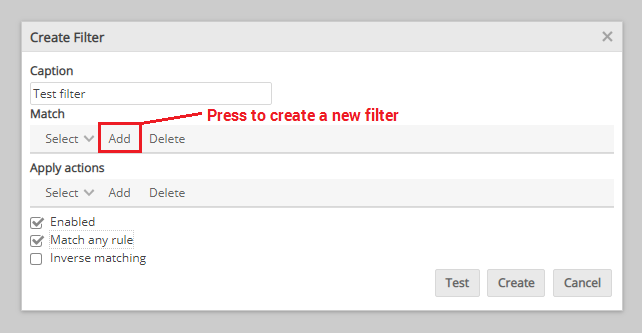 Enter "Test filter" in Caption field (you can rename it if needed). First, we have to set up a match criteria - an occasion which will initiate our filter. We go to Match section and press Add. There we have to specify our regular expression. For our example, it will be just a keyword - Facebook. Now we go to "on field" drop-down and choose "Title and content". These both settings mean that we wish to filter articles that contain the word Facebook in either titles or descriptions. And then we choose what feeds we wish to filter. You can choose either one specific feed, a whole category or all of your feeds. Choose and press "Add rule". Note: you can set several rules at a time, and you have to do so if you wish to filter feeds also by a different keyword or to filter several categories or whatsoever. Now we go to Apply actions section and press Add. 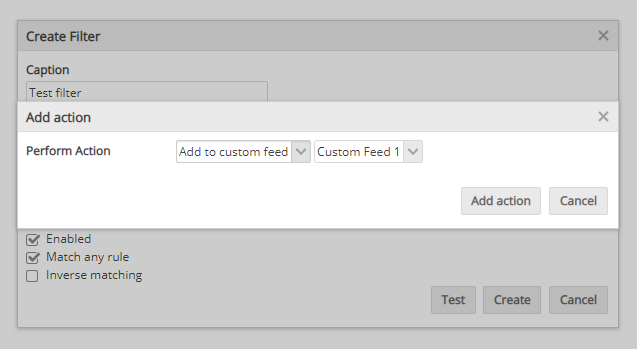 In "Perform Actions" drop-down choose "Add to custom feed" and then choose a custom feed from the list. Press Add action. As we already said you can set several rules for one filter, as well as several actions. 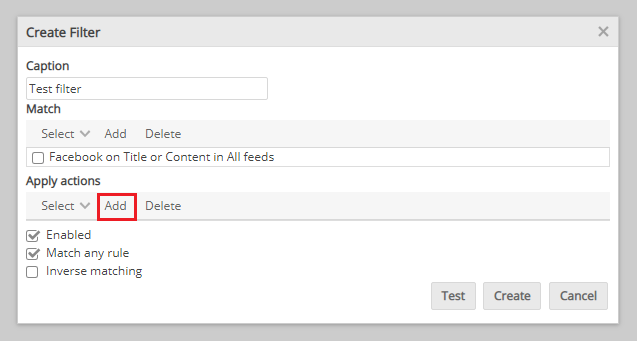 For example, we set to filter all our content feeds by two keywords - Facebook and Twitter - add them to our Custom Feed 1 and then mark them as Read. As soon as you create all your rules and actions, press Create. The same way you can create other filters using different regular expressions and actions. In Filters tab you will see your list of filters and will be able to manage them. 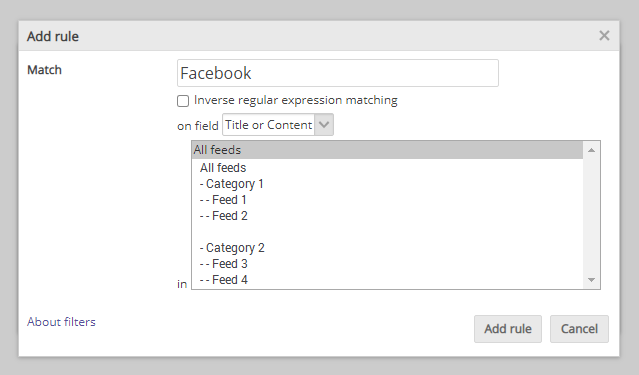 Also, read how you can use advanced filters with custom feeds to achieve better posting results.